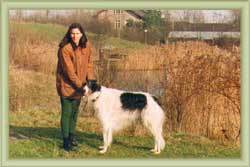 When we collected our little Apollo in July 1984 in the former Czekoslovakia we had no idea what a special Borzoi we brought home in our car! 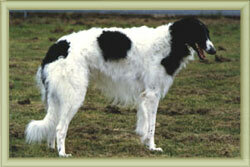 From the beginning, Apollo was a very self confident Borzoi who was not afraid of anything, and had a very imposing stature. During his show career he won 1 x CACIB, 7 x Res-CACIB, 7 x CAC, 7 x Res-CAC and several BOB's and obtained the title of a German Champion. Apollo always liked shows. He apparently had great fun being in the limelight, being adored and caressed by everyone. Therefore, I also showed him after his 8th birthday five times in the veteran class which he always won with excellent 1 and two times with best Borzoi veteran. Apollo reached the high age of 13½ years and enjoyed life to the fullest until the last day! 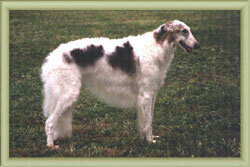 Djemanka has the most charming and gentle temperament one can imagine in a Borzoi. She is gentle towards people and animals and obeys from her own will. She has passed this special character to some of her offspring.